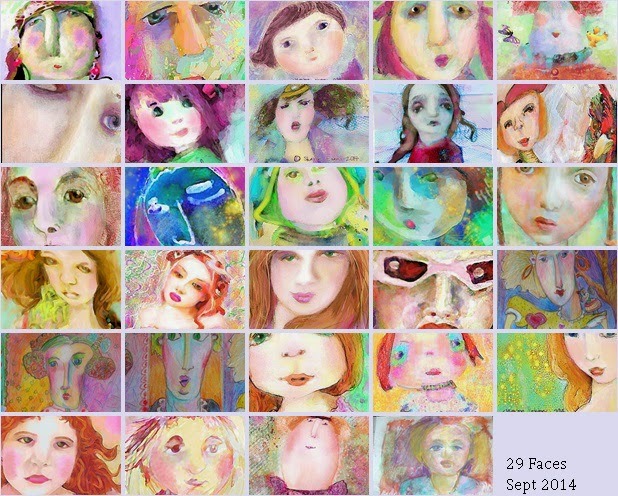 This week I completed the 29 Faces for Ayala Art’s 29 Faces in September. If you want to know the stories behind the last 4 faces go here. I actually do have a plan for some of them, but more about that later. Here is a compilation of the faces I did last month (some of them are cropped because some of my dimensions were different. If you want to see them all in full go here. I had planned to have a break from art this week and get into the garden. But the weather hasn’t been suitable, you k now what spring weather is like very changeable to say the least! But all was not wasted as when I saw the theme for October at Art Journal Journey set by Sheila from Orange Esmeralda I was delighted. It is: Deep in the Forest! For ages I have had this box, years ago I use to paint these boxes for gifts and inside there was stuff particular to the person concerned. So here was this box littering up the place, I had a brain wave I would paint inside of it. So out came the acrylics and I got started…. I love our native bush her in New Zealand, It is often very dark and mysterious and you can imagine another world of creatures living there. Often little creeks trickle through the trees creating a sparkling light. What I love the most are the small waterfalls, they are such a surprise to come across. Our bush is like this box from a distance the dull olive green of the canopy hides a world of treasures and surprises. I so enjoyed doing this that I think I will have to get some more boxes made to paint!!! My inspiration. The falls are about 50 km north from here and the bush scene is about 10 km in the Tararuas. your faces mosaic is wonderful, sharon! and i LOVE the painted box, what a gorgeous idea! good to have nature around that inspires! An amazing box Sharon as well as your collection of faces! Congrats on being featured at PPF ! Thank you for joining AJJ this month again! Oh that box is looking great, such an energy in your painting, I can feel the rush of the water, wonderful work. Your faces really blow me, they are unique in your style and I love them! What a brilliant idea to paint the waterfall inside a box, really terrific, and I like the idea of a waterfall deep in the forest. I've enjoyed all of your faces and the very clever stories you made for them. I LOVE your box! It's literally like a door to a magical world, and the colors are fabulous. Blessings! love your amazing box with the painting,its georgus idea,and your faces so wonderful. I'm so mad at myself for completely forgetting about the faces challenge in Sept! Your faces turned out beautiful! What a collection of faces that are all lovely. Neat idea to paint the inside of the box too. The painted box is wonderful, Sharon. It looks mysterious and fitting for the theme of deep in the forest. I hear that New Zealand is a very beautiful place, still abundant in natural beauty. What an interesting idea for painting a box--I would never have thought of doing up the inside! I love your collage of faces, too--they're amazing. Mysteriously intriguing work my dear! So happy to see your girls on ppf! I will miss your wonderful faces and stories to go with them! Amazing compilation of your faces!! LOVE THEM ALL!! Lovely collection of faces, and wonderful what you did for the forest theme too. Oh, so lovely paintings and photos! Good to see your 29 faces too! Wow, your country has so much beauty! I love your box, it's so full of wild freedom, and your faces are all so unique! To paint all of those faces with such unique expressions... all gorgeous and then you paint inside of a box!!! The theme Deep into the Forest works so well with your painting. I adored New Zealand when we visited so it was lovely to take a quick trip back. Thank you for all of your inspiring work. Sharon - your box is amazing - what a wonderful idea. Anything can be a palette. Oh my goodness a big Ta dah !!! That box is beautiful. What a fantastic idea to use the inside as a 3D scene. It reminds me of a sort of puppet theatre format. So many possibilities! I am so impressed by your faces a wonderful achievement. I particulary like your larger ladies. I think they have such personality.! Such an inspiring piece of art, dear Sharon! I love the combination of an abstract, colourful painting with the character of the box, which veils and unveils at the same time! Although so abstract, it is easy for me to see the landscape within. You opened my eyes! Thank you for sharing!